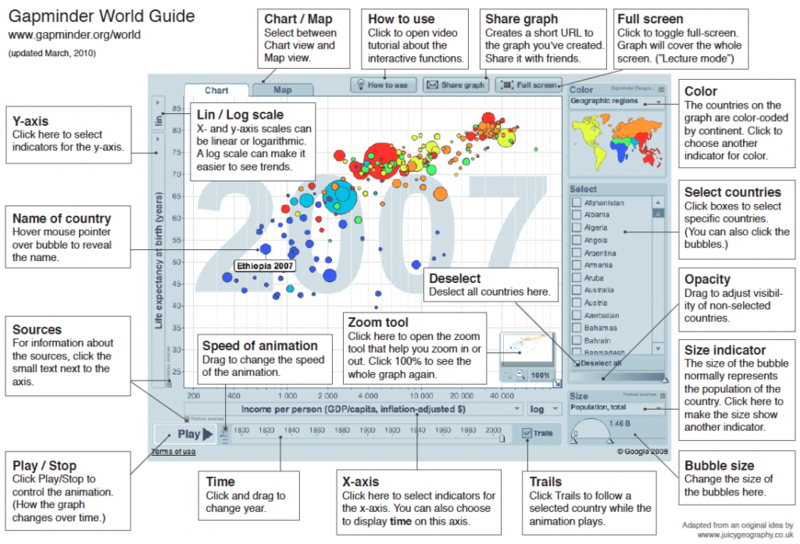 Gapminder is a neat, FREE site that was created by Hans Rosling. This site gives great visual representation of trending data that is happening around the world. To learn all about how each part of the visual data Gapminder works, check out the image below. Click on the image to open the enlarged pdf file. Gapminder also has a Teacher section. In this section there are tools and guides for Gapminder in a classroom, including webinars with Bob Lang. I had the pleasure to meet Bob and he is a very bright man. Below is a TED talk given by Hans and he explains how the world’s population will grow to 9 billion over the next 50 years. Hans shows off a visual representation about raising living standards of the poorest people with colored boxes.